To obtain the relationship between radon solubility and temperature, salinity, and pH of radon-bearing water in in situ leaching uranium mines, an experimental device for measuring the radon solubility in water was designed and manufactured. According to the range of temperature range, salinity, and pH of radon-containing radioactive water from in situ leaching mines in China, aqueous radon solubilities at different temperatures and salinities were determined using an orthogonal design and, concurrently, radon solubilities at different pH also determined. 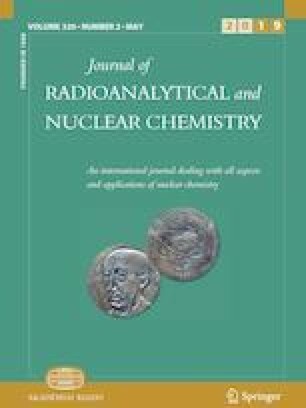 An empirical equation for estimating the radon solubility in radioactive water containing radon in uranium mining and metallurgy is proposed. This work was supported by National Natural Science Foundation of China (11575080). Hunan Provincial Natural Science Foundation of China (2018JJ2318) and the 2017 Graduate Research and Innovation Project Fund (2017YCXXM11).